The Studio Profil gas fire features timeless styling that fits in perfectly with virtually all interiors. Furthermore, the Studio Profil offers you six stunning frame colour choices from sophisticated Anthracite to expressive Metallic Red and is available on all sizes and fuel types of Studio gas fires. Like all Studio Glass Fronted log-effect fires the Profil offers a choice of either the black reeded or vermiculite linings, plus the chance to interchange your white stone fuel effects to any one of three coloured bead alternatives. Installing Televisions above Open Fronted Studio Fires On a normal flue which is functioning correctly, Open Fronted Studios do not create a particularly hot environment on the wall above where they are installed. Therefore, it may be possible to install Plasma or LCD TV’s above them, as long as the distance to the TV is a minimum of 450mm from the top of the fire and as long as it has been checked with the TV manufacturers installation instructions with regard to installation and heat proximity. If in doubt please contact and check with your TV manufacturer. 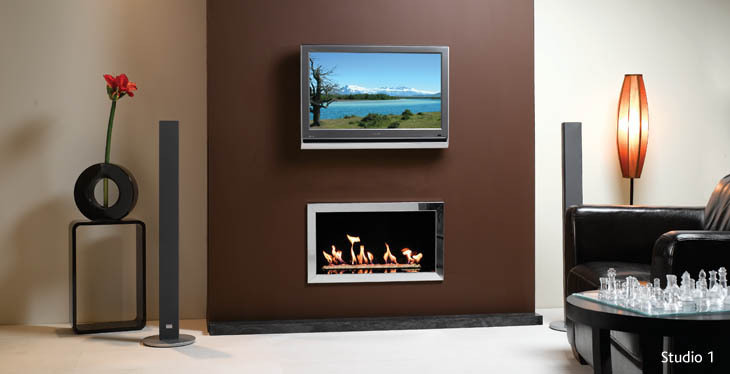 Glass Fronted Studio Fires Gazco does not recommend installation of televisions above Glass Fronted Studio fires. Finishes: Anthracite, Polished Stainless Steel, Metallic Red, Metallic Blue, Metallic Bronze and Ivory. Command Controls: Standard remote (Open Fronted) and Programmable Thermostatic remote (Glass Fronted).